Exercise is the key to weight loss, isn’t it? Well, if your answer is yes, I strongly suggest that you continue to read this article. As a dietitian, I advice all my clients to eat a healthy diet and exercise. I strongly believe in exercise as part of a healthy lifestyle because there is more than enough evidence proving the association between regular physical activity and improved health. So before we continue with this discussion, I want to highlight the importance of exercise. When it comes to weight loss, however, the effect of exercise should be further explored. You may have heard of the energy in equals energy out idea. Well, based on this concept reducing your caloric intake and increasing your energy expenditure through exercise should help you lose weight. While this works to some extent, its effect isn’t similar for everyone and there doesn’t seem to be a dose-dependent response. This is because the human body is very complex! This explains why a dietary approach may work for one person but not for someone else. Basal metabolic rate– the energy that a person expends at rest, which varies for every individual and cannot be controlled. Thermic effect of food– the energy used for breaking down food. Physical activity– the energy expended for various activities; the more active an individual is, the more energy is expended. The biggest portion of your total energy expenditure (~ 60-80%) is the basal metabolic rate, which as mentioned, cannot be controlled and is different for each individual. This is why certain people can eat a lot of food and still be skinny, while others would gain weight if they were to eat a 2000 calorie diet! The thermic effect of food contributes to about 10% of your total energy expenditure; if you eat more protein, you can increase this number (but that would be very insignificant!). The remainder (~10-30%) is what you expend through physical activity. While this could have an effect, you have to realize that it is not as significant as the basal metabolic rate. Now, while physical activity makes a small contribution, it could play a role in weight management. The challenge is that different individuals respond differently to exercise. In addition, individuals may exhibit certain behavioural responses to exercise, which impact their energy intake and expenditure. You may find that following an intense exercise you feel like lying down in bed or on the coach, and doing a sedentary activity. There is some evidence indicating that people tend to move less after exercise; this is a compensatory behaviour to slow down the person’s energy expenditure following exercise. Another response may be to eat more, either because of actual hunger or because the person feels entitled to treating him or herself after a hard workout. Of course, being aware of this, you can take control of your behaviour and make exercise more effective. For example, you may choose to time your exercise so that you take away the opportunity to rest excessively after a workout. For instance if you have to work on the computer, exercise beforehand so that your “rest” time coincides with your typical daily task, or exercise before going to bed so that you automatically rest! Also, avoid treating yourself just because you have exercised. If you feel hungry, choose low-calorie and nutritious foods such as salad and fruit. 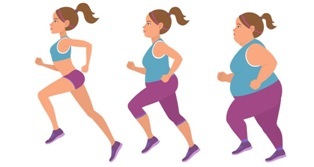 Here’s another phenomenon that may work against you; it has been suggested that the body slows down its basal metabolic rate following exercise. This is again a compensatory mechanism that is through to reduce your energy expenditure to make up for what was lost during exercise. In addition, it is thought that if you do more exercise, your energy expenditure starts to plateau. This means that more exercise doesn’t necessarily result in weight loss… unfortunately. As you have probably recognized, energy expenditure is a very complex phenomenon, which makes it difficult to outline a weight loss regimen simply through exercise. Generally speaking, managing your caloric intake in combination with regular physical activity helps with weight management. The discussion here is about the effectiveness of these strategies – what I would like you to take away from this article is that our body’s response to changes in energy intake and energy expenditure is very complex and varies from one individual to the next. Going back to our original question: does exercise help with weight loss? Evidence shows that it helps, but what we are arguing is the extent to which it makes a difference! In practical terms I’m arguing that burning 3500 calories on the treadmill may not necessarily be equal to losing 1 pound of fat. The point is to realize that this is a complex process and exercise alone is not necessarily effective in weight loss. I tend to think of exercise as a daily treatment that helps me stay healthy and strong. For weight loss, on the other hand, I consider healthy eating in combination with regular physical activity. When it comes to weight management, I am aware that avoiding the temptation of drinking a 400 calorie coffee drink may be equivalent to 1 hour of physical activity. I also recognize that different nutrients may have different impact on my metabolisms. I include whole foods and nutritious choices in my diet, avoid empty calories and make an effort to eat mindfully. This is what I can control after all! I was inspired to write this article after reading this article by Bellyz and Zarracina. If you are interested in topic, I encourage you to read their article and refer to the research they have cited.